Android is practically overflowing with options, and it's easy to lose track of some useful stuff along the way. With every new Android version comes a flurry of fresh features. Some of them immediately transform the way we work, while others just quietly fade away without making much noise. Then there are the features that fall somewhere in between — features that seem useful, maybe pique our interest, but then get lost in the shuffle and forgotten in day-to-day use. Especially when said features are out of sight and not at all obvious, they're all too easy to overlook over time. Well, consider this your friendly reminder: These hidden Android features, added into the OS at various points over the past few years, are still there and still incredibly handy. Take a moment to rediscover them, and you might be surprised at just how helpful they can be. One of the most useful features to come into Android in ages is also one of the least well-known and discoverable. I'm talking about the Alt-Tab-like fast app-switching function that was introduced in Android 7.0 and remains one of my favorite Android shortcuts to this day. You can be forgiven if you forgot about it — or maybe never even knew about it in the first place — because there's absolutely nothing that'd clue you into its existence. But assuming your phone is running Nougat or higher, you can double-tap the Overview key (the square-shaped icon next to Back and Home) anytime to quickly zap between your two most recently used processes. It'll even work from your home screen for a swift return to whatever app you had open last. Another tucked-away treat added in the Nougat era is the ability to customize the order of apps in Android's system-level Share menu — so you can keep your most frequently used destinations at the top of the list for easy ongoing access. All you've gotta do is share something from an app, like Chrome, and then press and hold any destination in the list and select the "Pin" option that appears. You can pin multiple sharing destinations, too, and they'll appear in alphabetical order at the top of your list. The one confusing catch is that not every app actually uses Android's default system-level Share menu. Google Photos, for instance, has its own custom menu (which is what allows it to include app-specific items like creating shared albums and sharing things directly with other Photos users). In those sorts of confusing exceptions, your customizations won't show up. But in the vast majority of apps where sharing is an option, you can keep the stuff you use the most in the most convenient place — and who wouldn't want that? An oft-overlooked feature introduced all the way back in 2014's Android 5.0 Lollipop release is a little somethin'-somethin' called screen pinning. It lets you lock one specific app or process to your screen and then requires you to unlock your device before anything else can be accessed. The idea is actually quite sensible: Say you're passing your phone off to a friend or co-worker — maybe so they can see a document, look at something on a website, or make a quick call when their own phone isn't nearby. Take two seconds to pin whatever app is relevant to that purpose to your screen, and you can rest easy knowing the rest of your stuff will remain secure and inaccessible until the phone's back in your hands. To use the feature, first look for "Screen pinning" in the Security section of your system settings to make sure it's enabled. Then just tap your phone's Overview key and push the on-screen cards up as high up as they'll go. See that circular icon in the lower-right corner of the bottommost card? Tap it, and that's it: That app will now be pinned to your screen. You'll have to hold the Back and Overview keys together and then unlock your device before anything else can be opened. If you're anything like me, you probably use your phone's Quick Settings panel a fair amount — to quickly connect to a Wi-Fi network, fire up your flashlight, put your phone into Do Not Disturb mode, or whatever. If you're anything like me, you probably also forget how easily you can expand and customize what shortcuts appear in that section. But basic rearranging is just the start of what you can do: Nougat also enabled support for third-party Quick Settings additions. You can add tiles for keeping your phone's screen awake, pulling up any widget on demand, or jotting down a quick note and then sending it somewhere. There are tiles available for displaying the weather and controlling smart lights. There are even massive power-packs that give you menus full of system- and app-related functions to put into your phone's Quick Settings section. The options are practically endless. All you've gotta do is remember to take advantage of 'em. 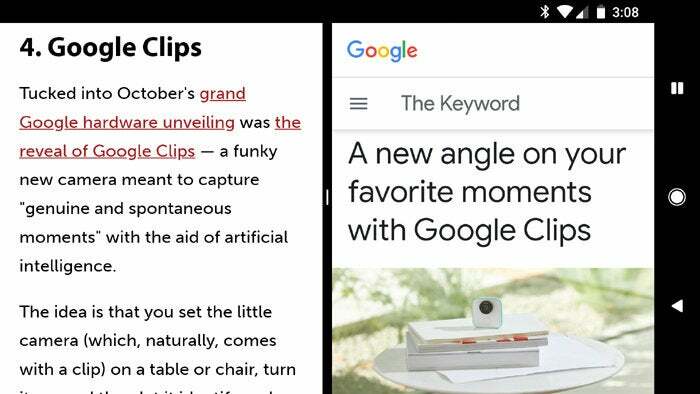 Android's split-screen mode is something I rarely find useful in practical smartphone-toting terms, but there are certain situations where it can definitely come in handy. One of them is with a function that's especially out of the way and easy to forget about: the ability to view two Chrome tabs together, on your screen at the same time. 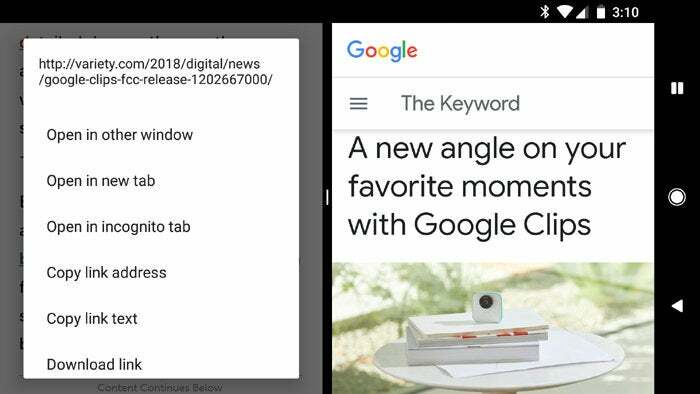 Assuming you have a phone that uses Google's own native Android split-screen mode, open up Chrome and then press and hold your device's Overview key to get started. 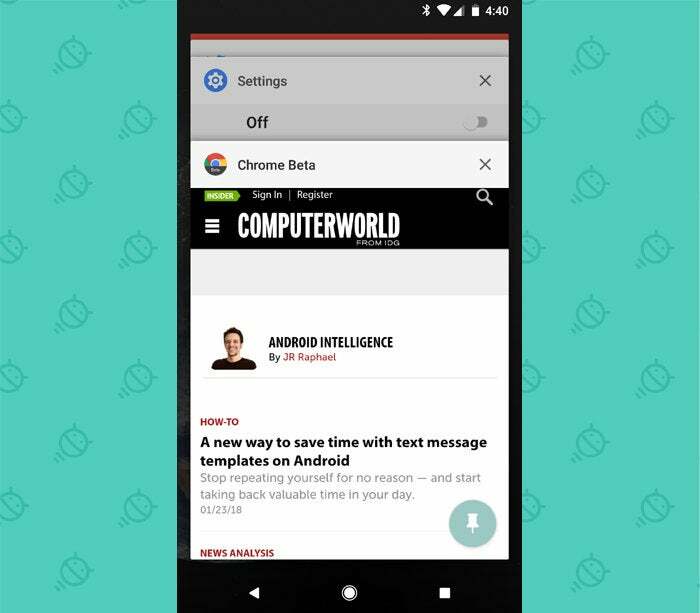 Once your screen splits in two, tap the overflow menu icon in the upper-right corner of the Chrome window and select "Move to other window." That'll pop your current tab over to the other side of your screen and let you open up something else in that first half of the display. You can even do the same thing by long-pressing a link on one side of the screen and then selecting the option to open it in the other window. Two tabs, side by side, living together in virtual harmony. Ain't it grand? You aren't still manually silencing your phone at night or when you're in meetings, are you? Ever since Nougat, Android's had a native way to do that for you automatically — if you know where it is and remember to set it up. Dig around in the Sound section of your system settings. You should see something there about Do Not Disturb; tap it, and you'll find a customizable list of automatic rules for how your phone should behave during different times and conditions. Set 'em up, activate 'em, and then rest easy knowing your mobile companion's always got your back. All right, this last one only applies if you're among the lucky few with Oreo, but it's still worth mentioning — because it's an immensely valuable feature that's incredibly easy to overlook. Oreo's Notification Channels system lets you take granular control over how and when apps are allowed to interrupt you. It's a pretty powerful option to have, and it's well worth exploring. If you have Oreo but haven't gotten around to trying it yet — or maybe looked into it once but haven't revisited it since — read this to get started. A few minutes of configuration now can turn your phone into a more effective tool indefinitely. And that, dear readers, is what mobile productivity is all about.